Benmont Tench was all of 12 or 13 when he first encountered future rock star Tom Petty in 1960s' Gainesville, Fla.
"He was an older kid. He had a good haircut and was in a band -- very impressive and very intimidating," Tench recalls. "He worked in a music store where I used to go mess around with all the instruments." The piano-plating Tench also noticed a third kid in the neighborhood, a guitarist named Mike Campbell. Little did Tench know that the three were destined to become as close as brothers while traveling the globe, playing music and making piles of money. "I never had any brothers, so these literally -- as corny as it might sound -- are my brothers. We grew up together. And you become incredibly close," says Tench, now 45. 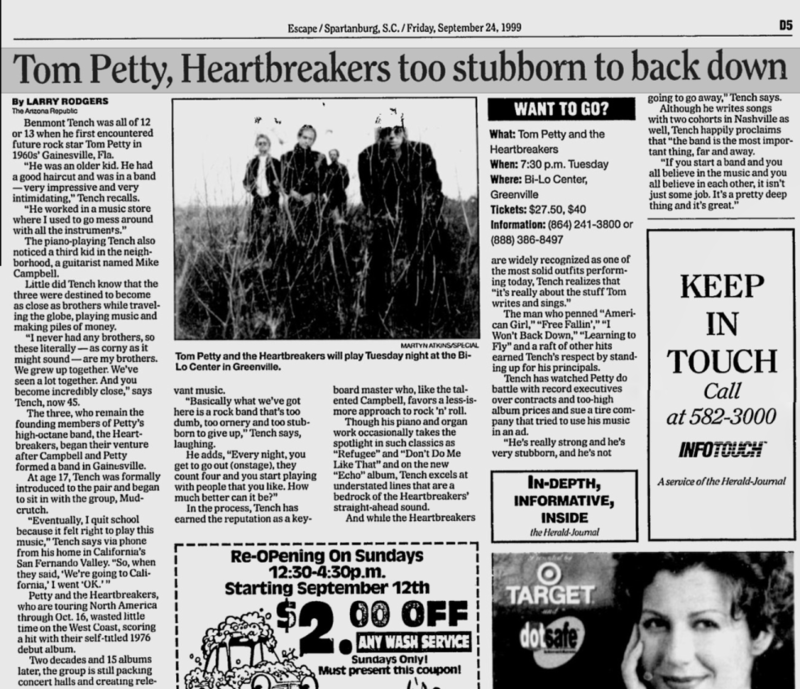 The three, who remain the founding members of Petty's high-octane band, the Heartbreakers, began their venture after Campbell and Petty formed a band in Gainesville. At age 17, Tench was formally introduced to the pair and began to sit in with the group, Mudcrutch. "Eventually, I quit school because it felt right to play this music," Tench says via phone from his home in California's San Fernando Valley. "Som when they said, 'We're going to California,' I went 'OK.'" 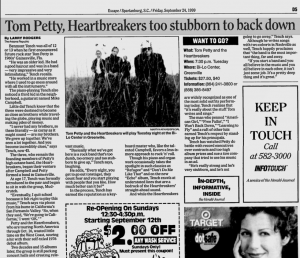 Petty and the Heartbreakers, who are touring North America through Oct. 16, wasted little time on the West Coast, scoring a hit with their self-titled 1976 debut album. Two decades and 15 albums later, the group is still packing concert halls and creating relevant music. "Basically what we've got here is a rock band that's too dumb, too ornery and too stubborn to give up," Tench says, laughing. He adds, "Every night, you get to go out (onstage), they count four and you start playing with people that you like. How much better can it be?" In the process, Tench has earned the reputation as a keyboard master who, like the talented Campbell, favors a less-is-more approach to rock 'n' roll. Though his piano and organ work occasionally takes the spotlight in such classics as "Refugee" and "Don't Do Me Like That" and on the new "Echo" album, Tench excels at understated lines that are a bedrock of the Heartbreakers' straight-ahead sound. And while the Heartbreakers are widely recognized as one of the most solid outfits performing today, Tench realizes that "it's really about the stuff Tom writes and sings." The man who penned "American Girl," "Free Fallin'," "I Won't Back Down," "Learning to Fly" and a raft of other hits earned Tench's respect by standing up for his principals. Tench has watched Petty do battle with record executives over contracts and too-high album prices and sue a tire company that tried to use his music in an ad. "He's really strong and he's very stubborn, and he's not going to go away," Tench says. Although he writes songs with two cohorts in Nashville as well, Tench happy proclaims that "the band is the most important thing, far and away." "If you start a band and you all believe in the music and you all believe in each other, it isn't just some job. It's a pretty deep thing and it's great."